OK, here goes. Don’t say we didn’t warn you! Spoilers ahead for Avengers: Infinity War. The battle against Thanos exacted a terrible toll on Earth’s Mightiest Heroes. Despite the Avengers’ best efforts, the Mad Titan successfully acquired all six of the Infinity Stones and achieved his insane goal of “rebalancing the universe.” Thanos snapped his fingers, and killed half of all life. Our heroes could only watch in horror as their closest friends and allies crumbled to dust. So who’s left to, well, avenge this horror in Avengers 4? Here are the heroes we know made it out of Infinity War alive. We haven’t included characters seen in set photos from the next movie; those could have to do with an inter-dimensional adventure, or time-travel could be a factor. This list includes only those characters viewers actually saw survive the end of Infinity War. Steve Rogers was just an ordinary, albeit patriotic kid from Brooklyn. His heroism led him to become America’s Sentinel of Liberty, but the battle against the Red Skull cost him dearly. Rogers has been a man out of time, stranded in the twenty-first century, participating in the battle to avert what must surely seem like the end of the world. Rogers gave up the identity of Captain America in Civil War, but that doesn’t mean he’s stopped being a hero; at heart, Steve Rogers is a good man who simply cannot stand by and watch as a situation goes south. Now he has failed, in the most painful and personal way. Against Vision’s wishes, Steve refused to let Scarlet Witch destroy the Mind Stone, and now half the life in the universe has been wiped out. Even the unfailing optimism of the former Captain America will surely be shaken as he crouches in the ashes that were, just moments ago, his oldest friend. Yet Iron Man may be the greatest hope for life. Doctor Strange handed over the Time Stone to spare Stark’s life, and his last words were oddly reassuring: “There was no other way.” Strange had peered through the mists of time to the “ultimate outcome” of millions of different scenarios, and there was only one in which Thanos was finally defeated. No doubt keeping Tony Stark alive was necessary in order to guide reality down that route. Before Thanos’s victory, few heroes had lost as much as the Son of Odin. His father’s death unleashed Hela, ultimately leading to the destruction of Asgard. Thor wound up leader of a small number of Asgardian refugees. Those refugees crossed the path of Thanos, and Thor had to watch as their number was halved – and his remaining friends and his brother were brutally murdered. Swearing vengeance, the God of Thunder gained the awesome power of Stormbreaker at Nidavellir. Thor joined the Battle of Wakanda, and came within a hair’s breadth of killing Thanos, but ultimately failed. Rather than take the head shot, Thor had slammed Stormbreaker into Thanos’s chest, wanting Thanos to face Thor as his killer. This moment of weakness gave Thanos the chance to snap his fingers, and cost Thor all he had left. The Thor of Infinity War was already suffering from PTSD. Now that will be compounded with new levels of guilt and responsibility. Had Thor made a different choice, Thanos might never have won. The Hulk has had enough of being treated as a weapon, and in Infinity War he refused to come out to play. That led Bruce Banner to suit up in the Hulkbuster armor, giving him an opportunity to prove himself a hero in his own right. Banner did well, with his quick wits actually leading to the death of a member of the Black Order. One of the few Avengers to actually have experience of the cosmic, thanks to the events of Thor: Ragnarok, Bruce could be a crucial figure in the fight to put matters right. 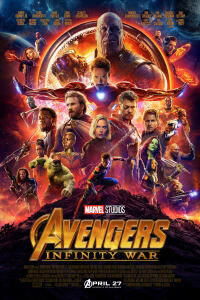 Ragnarok was the beginning of a sort of “loose trilogy” of Hulk films, with a specific character arc for Banner and the Hulk running on through Infinity War and into Avengers 4. “This will destroy Wakanda,” M’Baku warned as he stared out at the armies of Outriders charging towards the Golden City. He fought nonetheless, refusing to back down from the invaders. When the conflict was done, M’Baku was left standing in the field of battle as his warriors crumbled away to dust. The proud Jabari chieftain has once again been reminded what it is to lose. 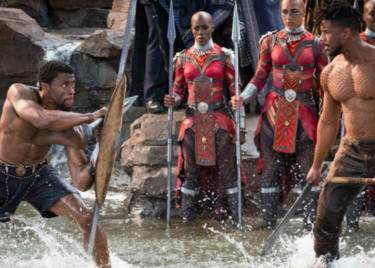 Wakanda will be left in chaos with the death of Black Panther, and M’Baku will be one of many who seek power. Will he push for the nation to return to its isolationist ways, or will he instead reach out a hand to a suffering world? Called Thanos’s daughter but really more his victim, Nebula escaped torture on Thanos’s Sanctuary II craft and launched a desperate attack upon him. More than any of Earth’s heroes, she truly understood what was at stake. Like Gamora, Nebula knew Thanos’s insane goal, and had been brought up under his twisted philosophy. When the film ends, Nebula and Iron Man are the sole survivors of the Battle of Titan, slumped in defeat on a ruined and ravaged world. In the comics, Nebula was actually key to undoing the “snap.” Nebula gained possession of the Infinity Gauntlet herself, and simply reversed everything Thanos had done, saving half the life in the universe. She could easily prove to be a key player in Avengers 4. The General of the Dora Milaje has failed in her duty to preserve the life of her King. Any chaos that befalls Wakanda in the future is likely to be deeply personal for Okoye, as she will carry the weight of this failure. It’s doubtful Okoye will be part of the mission to defeat Thanos and reverse his actions. She’s more likely to be focused on her homeland. “Well, I’ve got lots to lose,” Rocket snarked. Now, he’s lost everything. Heartbreakingly, James Gunn has revealed that Groot’s last word to Rocket was a cry of pain: “Dad.” No doubt Rocket will be absolutely devastated by the events of Infinity War. But it’s important to remember that he doesn’t know he’s the last of the Guardians, as he has no way of knowing what befell the others on Titan. All he knows right now is that Groot is dead. 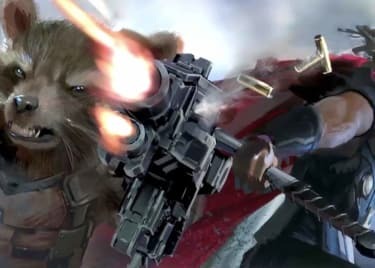 Rocket could be one of the Avengers’ most important allies. He knows more about the universe than any Avenger, with the possible exception of Thor. He could be crucial to tracking down Thanos. Finally, there’s War Machine. James Rhodes has been one of Tony Stark’s closest friends and allies, and it cost him his legs. 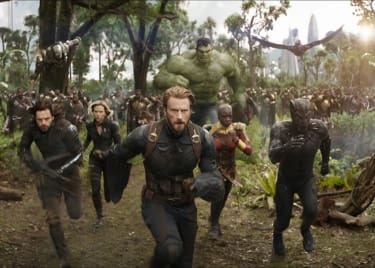 Rhodes proved to be one of the Avengers’ most formidable members during the Battle of Wakanda, laying down a barrage of fire that dramatically reduced the numbers of invading Outriders. He was no match for Thanos, though, and was slapped down with a contemptuous ease. Still, he’s alive. Rhodey’s a military man first and foremost, so he’ll focus on dealing with the horrors in front of him. It will take a man like Tony Stark to motivate Rhodey into trying to undo what Thanos has done. Avengers 4 opens on May 3, 2019.